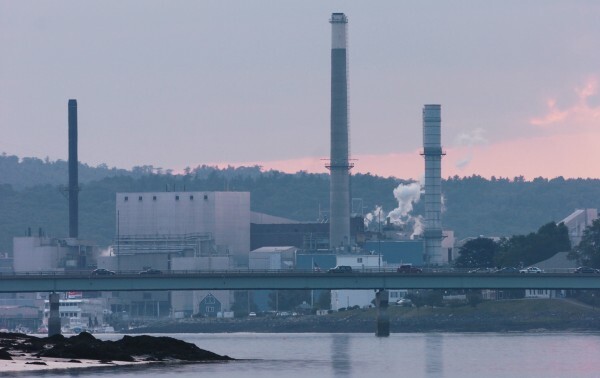 BUCKSPORT, Maine — Verso Paper Corp. officials announced plans Tuesday to eliminate 125 positions at the Bucksport mill and to permanently shut down one of the mill’s paper machines in response to high production costs and weak demand for lightweight paper. The job cuts will be effective Oct. 23 and likely will involve a combination of voluntary and involuntary layoffs, according to company officials. Verso employs more than 700 people at the Bucksport mill as well as nearly 900 at a Jay facility. The Jay mill was not affected by Tuesday’s announcement. Verso spokesman Bill Cohen said the papermaking machine slated to be shut down in Bucksport as well as two at a mill in Sartell, Minn., are the most expensive to operate for the company. The No. 2 machine in Bucksport dates back to the 1930s, although it has undergone extensive updates and upgrades over the years. The machine recently was shut down for roughly nine months because of market conditions. Additionally, the market for coated groundwood paper — lightweight paper used in catalogs and magazines — has been weak and shows little sign of recovering, Cohen said. After the shutdown of the No. 2 machine, Verso still will operate three machines in Bucksport. Verso’s plans to permanently stop production on the two machines in Sartell, Minn., mill will result in 175 layoffs. Company representatives were meeting with employees at both mills on Tuesday to explain the voluntary severance package. Duane Lugdon, a United Steelworkers union representative based in Augusta who works with the two local USW chapters in Bucksport, said the announcement did not come as a surprise given the financial challenges facing the paper industry. Union representatives plan to meet with Verso officials this Thursday to discuss how the layoffs will be carried out. In addition to the USW, three other unions — the International Brotherhood of Electrical Workers, the International Association of Machinists and Aerospace Workers, and the Office and Professional Employees International Union — represent employees at the Bucksport mill. An individual who answered the phone at the IBEW Local Union 1777 office in Bucksport declined to comment on the layoffs. Members of Maine’s congressional delegation expressed dismay at news of the layoffs and pledged to do what they could at the federal level to assist the workers losing their jobs. Paper mills in Maine and across the country have struggled in recent years to remain profitable in the face of shrinking demand because of the recession and market changes as well as increased competition from mills around the globe, especially in China. In its latest financial statements, filed in August, Verso reported a net loss of $24.3 million in the second quarter. That was an improvement over the same period a year ago, when Verso had a net loss of $44.3 million. Verso reported a net loss of $68.9 million for the first six months of 2011. Robert Rice, a University of Maine professor of wood science, said mills in Maine such as Verso’s Bucksport facility specialize in higher-quality, heavier coated paper used in publishing. Market conditions in sales and the cost of fiber locally make it difficult for Maine mills to compete when it comes to the thin, lightweight coated paper often used in catalogs or inserts, he said. Dave Milan, economic development director for the town of Bucksport, said Verso representatives have talked openly about the high cost of running the No. 2 machine and the market challenges. At the same time, the company has continued to invest in and modernize the Verso plant in recent years in an effort to remain competitive, which Milan said is a positive sign. He said it was unclear Tuesday how many employees will be out of work versus how many may retire or leave the mill due to attrition. But Milan said the town would work with laid-off millworkers who need assistance. The news from Verso adds to other job losses announced in Maine over the last week. On Monday, Barber Foods in Portland announced it was laying off 71 workers. On Friday, Global Contact Services abruptly laid off 65 employees at its call center in Pittsfield and closed the offices there. The Verso news also comes at a time when the company and the unions are working to complete a new contract. Employees at the mill have been working under the terms of the old contract since it expired on April 30. Cohen said the contract negotiations and Tuesday’s decision were entirely unrelated, and Lugdon with the USW said he has no reason to believe that members will reject the new contract during a vote scheduled for the coming weeks. “But obviously that is up to the members,” Lugdon said. Verso said shutting the No. 2 paper machine at the Bucksport mill will reduce the company’s annual coated groundwood capacity by 90,000 tons or about 10 percent. The shutdown of the two paper machines in Minnesota will reduce Verso’s production by roughly 103,000 tons. The Verso shutdowns will result in a charge of about $22 million, expected to occur primarily in the fourth quarter of 2011. The company said that includes $13 million for severance and benefit costs, $7 million in accelerated depreciation of property and equipment and $2 million in other costs. “The decision to permanently reduce production at Bucksport and Sartell was difficult and we are mindful of the impact it will have on the affected employees and their families,” Verso President and CEO Mike Jackson said in a statement. Verso’s stock price was down 4 percent Tuesday at the close of trading on the New York Stock Exchange.